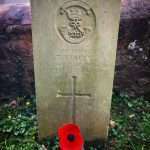 One private soldier – For the fainthearted . . .
One can stand on a hilltop at the Somme and see cemeteries stretching in a dotted line as far as one can see. One can drive through the flatlands of Flanders and encounter cemeteries in unexpected places. One can visit the memorials at Thiepval and the Menin Gate and Tyne Cot and countless other places and count tens and tens of thousands of names. One can visit Notre Dame de Lorette and scan the names of the 579,606 men of all sides who died in the region of Nord-Pas-de-Calais between 1914 and 1918. One can contemplate five and six and seven figure numbers, and then a single grave can come with a jolt. 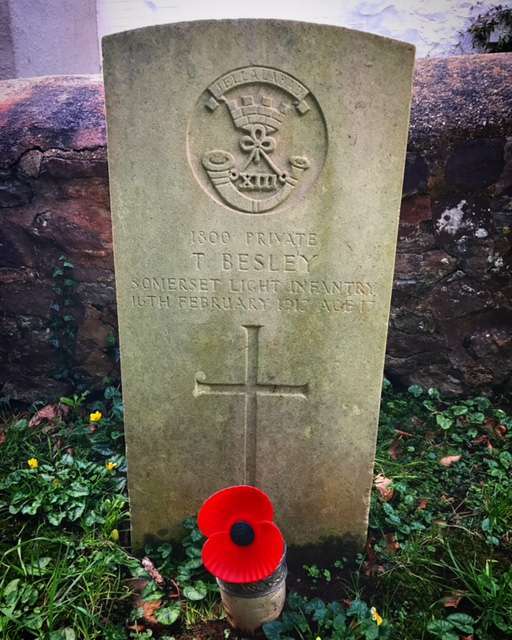 The Commonwealth War Graves Commission website says that Thomas Besley served in the 3rd/5th Battalion of the Somerset Light Infantry and that he was son of Steve and Fanny Besley, of Holelake, Wellington and was born at Wiveliscombe. No details are given of the circumstances of his death. Thomas Besley’s headstone has the standard inscription provided by the Commission, any additional lettering would have been at the expense of his family; perhaps they were content with the form of wits provided, perhaps they felt that being expected to pay for lettering only added to the pain. There is a painful incongruity in the intrusion of the reality of the Great War into the tranquility of a country churchyard. There is an added poignancy in the grave of this one private soldier, Thomas Besley was seventeen years old. Thomas Besley should not have been in the army, the minimum age for military service was eighteen. He must have falsified his age in order to enlist, no doubt in the company of others who similarly misrepresented their ages. Had he waited for conscription, waited to be called up, his papers would not have arrived until he was eighteen and he may have lived to a ripe old age. The grave of Thomas Besley is the grave of a boy who did not need to die. Perhaps it pulls one up because it personalised the appalling waste of humanity that was the so-called Great War for Civilisation. What’s rather disappointing is that the CWGC insists that two graves are in Kilkenny are in a cemetery that didn’t exist until the 30s. The two were buried in the Workhouse cemetery which was at the time used by the mental hospital and those that couldn’t afford a normal grave. I did contact the CWGC but it would seem they didn’t send out anyone to check for even today the map label isn’t in the correct spot. I have noticed a few glitches on the website, the person notified probably hasn’t authority to make the changes!